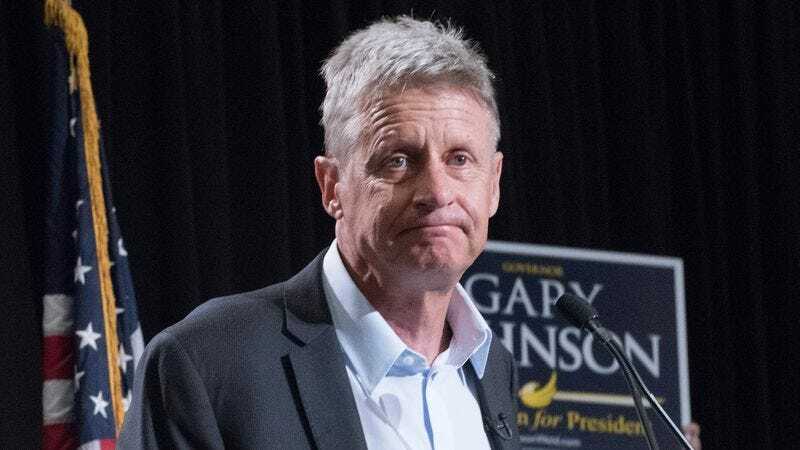 SEATTLE—Speaking privately with advisors between campaign stops Thursday, Libertarian Party presidential candidate Gary Johnson expressed his concern that he was peaking too early after reaching 9 percent in national polls, sources reported. “Boy, this doesn’t look good—it’s way too soon for my numbers to be spiking like this,” said a visibly uneasy Johnson, who added that there was no way he could maintain the sky-high support of nearly one in 10 voters for the remaining seven weeks of the election season. “I’d been hoping to keep expectations realistic, but now what am I supposed to do? I’m at 9.1 percent here—that’s practically double digits. If I try to keep that up, I’m not going to have any gas left in the tank come mid-October. Dammit.” Johnson then reportedly shook his head and quietly muttered there was “nowhere to go but down” after being informed his favorability numbers had skyrocketed above 20 percent.